Bauman Moscow State Technical University: Faculty of Biomedical Technologies - 20th Anniversary! Department of Biomedical Technical Systems - 40th Anniversary! The potentials of multichannel methods of precordial electrical impedance mapping for monitoring cardiac activity indicators are considered. 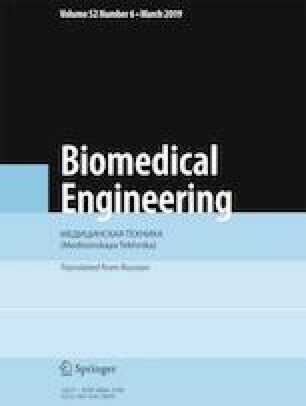 This review addresses the possibility of constructing models of blood in the heart allowing solution of the inverse impedancemetry problem to be used to determine the volume characteristics of heart activity and displacement of the boundaries of the heart, as well as movement of the center of mass of the blood in the heart during the cardiac cycle. Pilot studies of three healthy volunteers in comparison with MRI data were conducted. Translated from Meditsinskaya Tekhnika, Vol. 52, No. 6, Nov.-Dec., 2018, pp. 1-5.